In the face of growing securitisation and colonisation of Hebron's occupied old city, a set of community initiatives have emerged which seek to build resistance, protect human rights, and counter the economic and social decline of the area. The Hebron Protocol was intended to be an interim arrangement with caveats leading to greater Palestinian control; however the conditions of the agreement have remained in place for nearly 15 years. 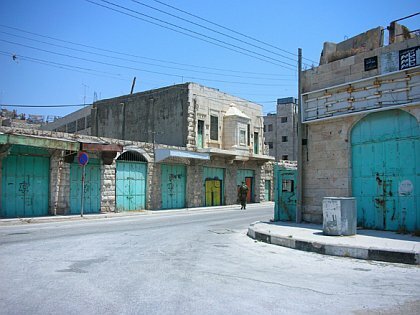 In the context of the Occupied West Bank, Hebron is a unique city as it is the only one with Israeli settlements in its ancient centre. The creation of settlements within the Old City of Hebron has been entangled with violence and ultra-orthodoxy since the first attempts were initiated in 1968. 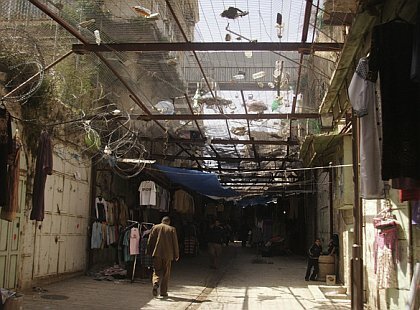 As a result of spatial security restrictions imposed by the Israeli army, such as the closure of the central business district of Al-Shuhada Street, the introduction of roadblocks and finally the construction of checkpoints, the Old City has suffered an economic and social death over the last 20 years. The UN Office for the Coordination of Humanitarian Affairs, reports that 80% of Palestinian adults in the Old City are unemployed, while an estimated 75% of the general population live below the poverty line. Concurrent with these spatial restrictions, Old City Palestinians have been the subject of physical, psychological and symbolic violence in their day-to-day lives, which has led to an atmosphere of fear and insecurity among residents. The policies of the Israeli occupation safeguard the daily lives of the several hundred settlers, leaving the Palestinians open to systematic direct and indirect forms of hardship. In the Old City the space is colonised from above by the settlers, who inhabit the higher floors of buildings in the heart of Palestinian neighbourhoods. From there, they periodically raid the buildings and streets, marking the space with dirt, refuse, insulting graffiti and national flags. These actions are manifestations of symbolic violence: a form of aggression which targets the values and cultural and social practices of a specific community. This materialisation of symbolic violence in everyday life has a tendency to normalise the situation particularly for the youngest population of the city who have never lived in an unoccupied environment. However, amongst these difficult conditions, the resilience and desire to live normal lives as expressed by Old City Hebronites is remarkable. Their actions known as ‘Sumud’ (steadfast perseverance) are a source of inspiration to those who espouse a peaceful solution to the Israeli-Palestinian Conflict. 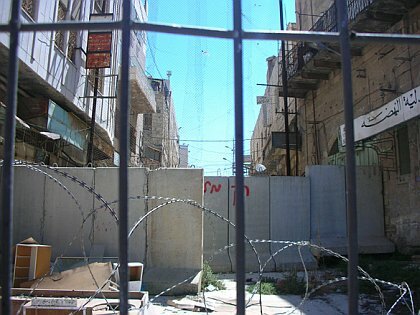 In Hebron’s Old City, conflict is played out through urban space in multiple ways. The forced evacuations, the displacement of everyday activities, and the suppression of public spaces can be seen as a violence against the fabric of the city itself. It is in this complex setting that the interdisciplinary initiative known as the Building Sumud Project[i](BSP) operates. The project focuses on the interaction between the spatial and social impacts of occupation in the Old City and the enhancement of resilience and conflict transformation through heritage and architecture. Since the first pilot study in 2010, the BSP multidisciplinary team of researchers has carried out multiple fieldwork exercises in partnership with Paris-Est University, the Palestinian Polytechnic University and Al Quds Open University with the support of the the Temporary International Presence in Hebron (TIPH) and the Hebron Rehabilitation Committee (HRC). The latter has been actively involved in preserving and rehabilitating the physical and supporting social fabric of the Old City. Sometimes they have to work in secrecy trying to preserve old houses in the “forbidden” H2 area. Their mission, to keep the historic buildings alive for future generations, despite the occupation, obtained the Aga Khan Award for Architecture in 1998. Through this fieldwork, the BSP has mapped the effects of the presence of the illegal settlements on the residents of the Old City, using a mixed methodology that includes collections of life stories, walking tours, architectural mapping and interviews with relevant organizations. The integration of typical techniques from the social sciences with a spatial analysis provided the opportunity to explore both the individual/household level and the neighbourhood/community scale. As the project has progressed, three core research themes have emerged. 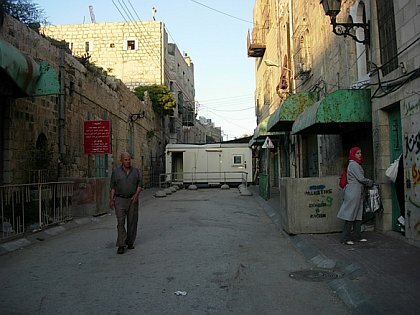 As the public or semi-public spaces of the city are subjected to harassment or threat from the settlers, the inhabitants have acquired a tendency to isolate or lock themselves inside their homes, compensating the loss of open spaces with courtyards or inner rooms of the house, where they spend time with neighbours or families. The traditional way of using the spaces shifts towards safer internal arrangements. Stephen Graham has described the situation in the Old City as urbicide: the fragmentation and destruction of architecture and the creation of hostile environments. On a daily basis this condition harms the population, with small doses of constant sufferance, which aims to erase their capability to imagine a different scenario for their future. The main strategy adopted by Old City Palestinians in order to reduce the effect of aggression on their lives is to avoid direct confrontation with settlers or soldiers, by for example, scheduling school timetables and planning spaces so that settlers and Palestinian children do not interact with each other, or by altering the use of spaces of livelihoods (rooftops or inner courtyards instead of streets). Unfortunately, the violent atmosphere is so extreme, that these Sumud actions are not enough to keep a proactive attitude towards the future. As these three themes relate directly to the physical and social realities of occupation they offer useful reference to consider when addressing the links between interventions in space and effective conflict transformation. In order to establish a physical presence for the Building Sumud Project in the Old City and to facilitate the introduction and running of practical initiatives, three architects from Oxford Brookes University, members of the BSP (Elisa Ferrato, John Lewicki and Mick Scott) have produced a design for a research and workshop centre located in a vernacular building in the Old City. 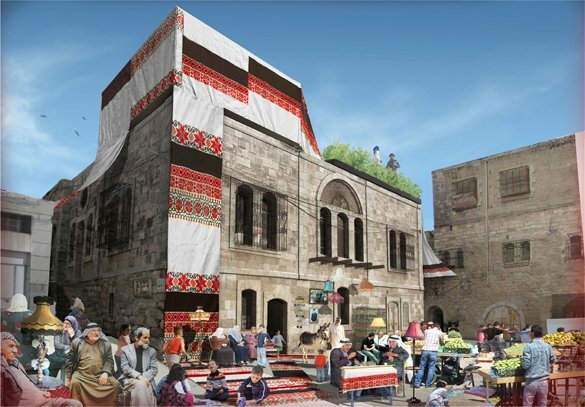 The concept design, known as PLUG-In Hebron (People Liberated Urban Gaps In Hebron) was conceived for the international UN-restricted Access competition hosted by Architecture for Humanity. 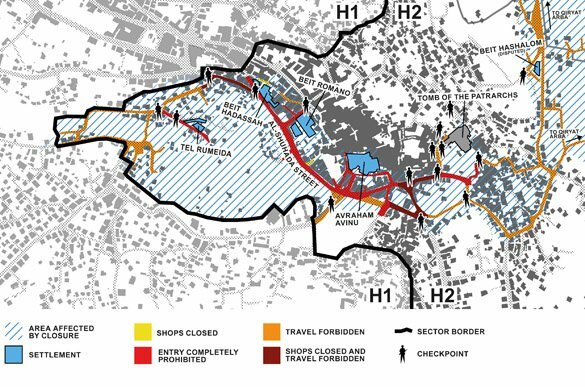 PLUG-In Hebron considers the Old City as a militarized space and utilises architecture as catalyst for an active, civic-led demilitarization and reclamation of public space. In the spirit of the BSP, the design seeks a reversal of the process of occupation that has severely disrupted civilian life, leading to deserted public spaces, community isolation and environmental degradation. The PLUG-In Hebron project won the “Small scale intervention” category of the competition and was exhibited at the 2012 Venice Biennale. From the outset, it was the intention of the designers to match the objectives of the BSP, the result of which was the concept of the functional ‘stratification’ into three zones of distinctive but complementary agendas throughout the floors of the building. Firstly, the Open Space on the ground floor and street level will encourage civic activity, allowing people to gather for events, markets, exhibitions and workshops, enlivening the public space in and around the building. The middle floor is designated as the Lab – an academic research centre. On the rooftop, is the Hub. Largely housed in a new semi-enclosed lightweight structure, this space operates as an amphitheatre embracing the spectacular views of the Old City – a greatly needed event space and open forum for dialogue on the future of Hebron. The lightweight wooden structure is intended to have little physical impact on the historic architecture, which contrasts against the army outposts and settlement architecture scattered across the roofs of the Old City. Layers of soft fabric patterned with traditional Hebronite embroidery cover it, expressing the values of the project. The colourful, soft and familiar volume is designed to engage people from its urban environs, whilst offering a comfortable, secure, private and screened space. This three-pronged programme is the expression of the BSP project agenda of advocacy, action-research initiatives, empowerment and enhancing local capacities by engaging with researchers, architects, activists, craftsmen, artists and community members. Here, architecture will be employed as a vehicle of conflict transformation in order to literally build resilience, to protect human rights, and to counter the economic and socio-environmental decline of the occupied Old City. The realisation of the project as part of the BSP will touch upon many contrasting interests and will have an immense symbolic value. Therefore, it is important to proceed carefully and sensitively, starting with a process of evaluation and negotiation with the HRC and other local stakeholders. The establishment of a permanent base in Hebron is fundamental to the realisation of the project’s long-term agenda. The first phase, proposed to take 3-5 years, is currently ongoing with the deployment of various advocacy and research initiatives. PLUG-In Hebron can be seen as the hub for the different actions, from the Public Space activation, which uses public spaces as initiators of social interaction that strengthen the ties inside the estranged communities; through the actions of the Observatory of Symbolic Violence which has begun monitoring the many forms of this indirect type of aggression; to the Sumud Ambassadors initiative focusing on younger generations, empowering their sense of belonging to the community and their possibilities for the future. 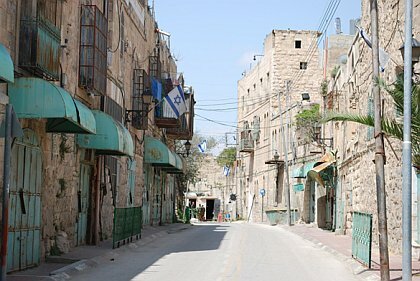 Among the more obvious impacts, it is intended that these actions will mitigate the effects of constant fear and insecurity on the psyche of the inhabitants of the Old City, many of whom have internalised decades of Israeli occupation, leading to self-imposed restrictions on movement, and a difficulty in envisioning an alternative future. Ultimately, through encouraging assertive planning and action in the face of an ever expanding and intensifying occupation, a combined architectural and social approach might offer a key to successful conflict transformation and a definitive contribution to the liberation process in Hebron. Braverman, Irus. "Uprooting Identities: The Regulation of Olive Trees in the Occupied West Bank." PoLAR: Political and Legal Anthropology Review 32.2 (2009): 237-264. [i] The Building Sumud Project is an action research initiative led by Dr. Brigitte Piquard, Reader at Oxford Brookes University, and run by the CERAR (Centre d’Études et de Recherches-Actions sur la Résilience) based in Paris, in partnership with the CENDEP (Centre for Development and Emergency Practice) in the School of Architecture at Oxford Brookes University.